I'd like to migrate my spatial data from MS SQL Server to PostGIS. Originaly the data was stored with SDE under MS SQL. Then I migrated with an ArcGIS tool. That created a spatial data column with WKB data. I've tried to migrate with ogr2ogr. All the data come through correctly except the geometry. I don't know why. ogr2ogr --config PGCLIENTCODING ISO-8859-2 -f "PostgreSQL PG: "host=localhost user=postgres dbname=test password=user" -sql "SELECT *, Geometry::STGeomFromWKB([Shape].STAsBinary(),23700).STAsText() AS [geom] FROM [test].[dbo]. [BARLANG_PONT]" -nln barlang_pont ODBC:intra -a_srs "EPSG:23700"
With this code the spatial field translated to WKT (varchar) text to the PostGIS. The default spatial is the wkt_geom (geometry) column. I could use the -lco GEOMETRY_NAME=geom code to rename the default spatial but the two columns have different types. The following steps works in nearly every case for this procedure. It may be a good idea to repair geometry if you find this process is not producing your desired results. There is the condition of truncated field names should they be greater than a certain length. Generally this is not as severe a problem as the actual transfer, though. 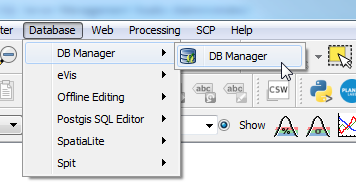 Open your MS SQL table through ArcGIS. Save this table out to a shapefile. If you are doing a 1-off migration, you could do it in QGIS. Add the MSSQL table as a layer. Navigate to the Postgres database that you want to import the data into. 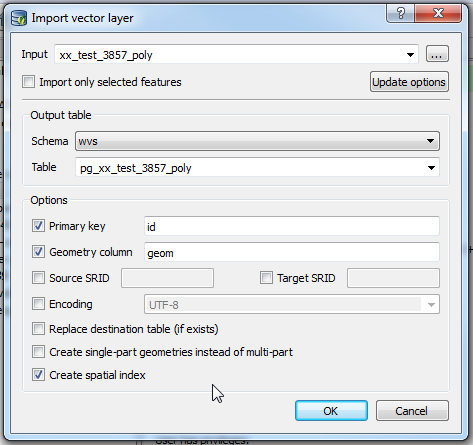 Specify your import options and press OK.
At this point, it is in the database but not QGIS. You can add it from the DB Manager. Not the answer you're looking for? Browse other questions tagged postgis migration sql-server-spatial or ask your own question. Getting geometry from multiple tables using PostGIS? 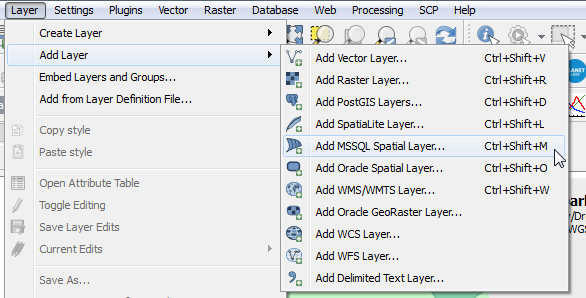 How to migrate PostGIS spatial data to MsSql spatial data? How to use -lco options in gdal_contour? How to migrate Postgres table having Lat Lon columns to an existing PostGIS database? How to backup QGIS (3.2.1) layer to independent PostGIS table?